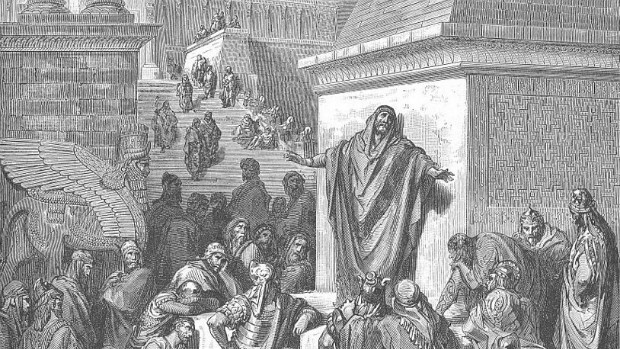 "Arise, go unto Nineveh, that great city, and preach unto it the preaching that I bid thee." Note that there are no conditions attached to this statement. The scriptures are full of examples of conditional prophecies, promising either benefit or detriment as a consequence of behavior, but this is not one of them. This prophecy, like those referenced in Brad's question, is one that paints a bleak picture for those to whom the prophecy is delivered. What's the point of such prophecy? Is it merely a way for advocates of a particular religion to express the power of their God? Or perhaps a way for God himself to flex his muscles? "So the people of Nineveh believed God ..."
This portion of the text clearly reinforces two important points. First, Jonah's prophecy of unconditional destruction is an accurate relay of the will of God. It seems unlikely that the text would confirm that the people believed God, with whom they did not interact directly, if Jonah had delivered the message inaccurately. Second, the people considered the prophecy of unconditional destruction to be true. Whether or not accurately reflecting a historical moment, in which differing persons would perhaps express differing opinions, the text attributes to the people of Nineveh a full acceptance of Jonah's prophecy. If the people of Nineveh had been like some fatalistic persons (religious or otherwise) of our day, they would have simply assumed that the unconditional prophecy implied that there was not much, if anything, they could or should do in reaction. Eat, drink and be merry for tomorrow we die! Or, perhaps, let us proclaim the power of God and hope in the next life! In either case, to hell with this world. "Who can tell if God will turn and repent, and turn away from his fierce anger, that we perish not?" Again, the text makes it clear that Jonah had accurately represented God. The prophecy of doom was unconditional and even fully volitional on the part of God. This is reinforced in the next chapter when Jonah becomes angry with God for making Jonah look like a poor prophet in the eyes of the people of Nineveh. Prophecy has no value if we do not interact with it. Moreover, prophecy has no value if it does not affect us profoundly enough to move us in interaction with it. This is true whether the prophecy is positive or negative. Like the people of Nineveh, we must choose to look at prophecy as something with which to interact. We must aspire to the fulfillment of the positive prophecies, and work against the fulfillment of the negative prophecies. This is our duty and opportunity, whether or not it makes the prophets impatient with us. The scriptures are full of prophecies, both positive and negative, regarding the future of our world. Will we see the millennial day of prolonged mortal lives, transfiguration, prosperity, renewal of this world, and creation of new worlds? Must we see moral degradation and political erosion? All things are not in our power, but we should and will, I am confident, do what we can to seize the opportunities and mitigate the risks ahead.